Click on the ' + NEW PLACE' button, enter the details of the new place and press the blue 'CREATE' button. 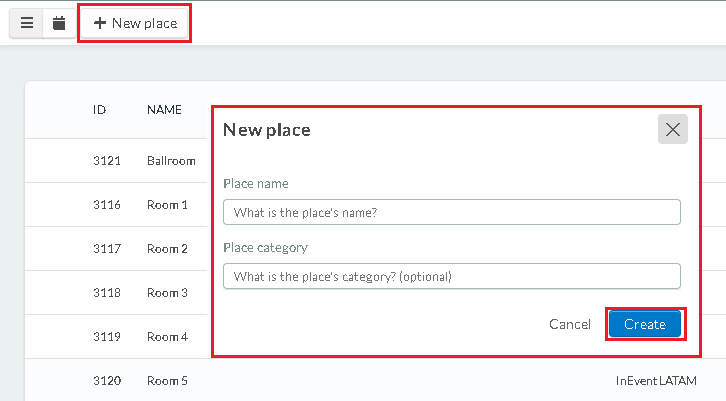 After creating the place(s), they will be available for the place option in your event details. Click on the 'EDIT' button in the top right corner and scroll down to the 'PLACE' field. Using the drop down bar you will see the places we have added. Choose one of them, then click on the 'END' tab in the top right corner. How do i delete a Company Place? To delete a company place Click on the 'EDIT' button, tick the check box of the place you want to delete and then press the 'REMOVE' button in the top right corner.